Caribbean Masters journey to the land of Jamaica while the Tri-state residents were dealing with the remnants of Sandy. Caribbean were faced with challenges of their own losing to St Anns and Clarendon to be eliminated after just two matches. Caribbean who were quarterfinalist a year earlier eventually enjoy the consolation by whipping Melbourne in the final group encounter. On October 28th Caribbean Masters played St.Anns Masters at Ultimate Oval, St.Ann, Jamaica. St.Ann won the toss and elected to take first strike. The host, St.Ann Masters piled up an imposing 246 for 8 wickets from 35 overs. Former Jamaica youth player, Carl Brissett scored a magnificent 136 (10 x 4s, 7 x 6s), to lead his side with good support came from Howard Harris 24 (3 x 4s) and Patrick Harty 21. Bowling for Caribbean Masters, Mark Audain 7/1/33/2, Tony Boyke 7/1/43/2, Keith Lawrance 6/0/31/1 and Farrow 3/0/30/1. During the inning break, there was a heavy shower, which introduced the Duckworth-Lewis method. Caribbean Masters’ revised target was 183 from 23 overs. Caribbean Masters could only manage 115/7 from the allotted 23 overs. Mark Audain topped scored with a polished 40 (3 x 4s, 1 x 6), Skipper Keith Lawrance 24, and H. Russell 22 among the runs. For St. Anns Masters, Carl Brissett 5/0/22/2, and A. Watson 5/0/32/2, were the pick of the bowlers, St. Anns Masters winning by 68 runs. A day later, Caribbean Masters tackled Clarendon Masters at Melbourne Oval, Kingston, Jamaica. Clarendon won the toss and elected to take first strike. Clarendon Masters thumped a whopping 283 for 5 from 30 overs, at just under nine and a half runs per over. W. Osborne 95 not out (5 x 4s, 7 x 6s), and R.Watson 92 (7 x 4s, 1 x 6), both missing out on tons. H.Howe 31 not out and F.Sappleton 23 played cameos of their own. Caribbean Masters’ bowling look limited with Keith Lawrance 6/0/51/2, and John Lavine 5/0/31/1 the best returns. 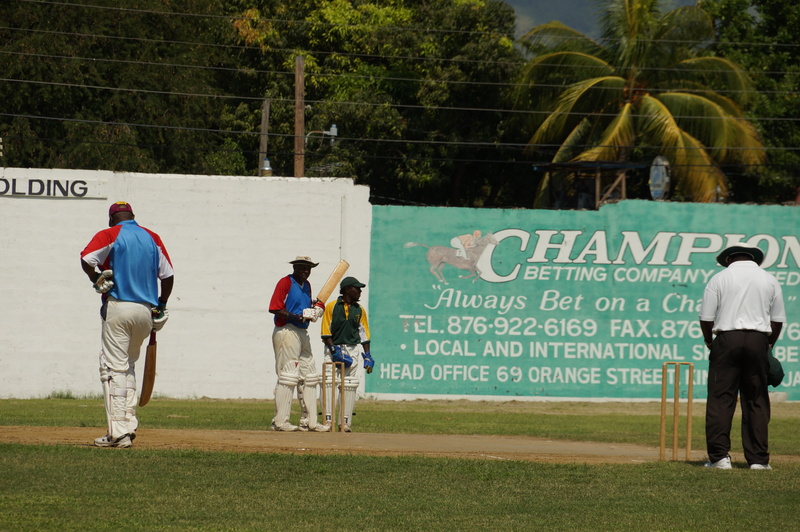 Clarendon grinded Caribbean Masters, skittled out for 83. Clarendon Masters with Bryson 5/2/3/3 as miserly as can be and Whittick 6/0/10/3 to lead Clarendon to a comprehensive by 200 runs victory. First there was dismay and then relief. For Caribbean Masters, Melbourne Masters were the mode of recover. At the Melbourne Oval, Kingston Jamaica, Caribbean Masters won the toss and elected to take first strike. Scores, Caribbean Masters 166/4 off 30 overs, Lloyd Reid topped scored with 44, skipper Keith Lawrence 42, and Mark Audain 28 (6 x 4s). Melbourne Masters 53 all out from 14 overs 23 of them being extras. Tony Boyke capped out the tour with a five-wicket haul scalping 5/23, with Mark Audain 3/5, and John Levine 2/20 able allies to construct a prideful 113 run win. This was the Michael Holding Annual Masters tournament in Jamaica, 12 teams participated, of them six local teams and six American based teams. This entry was posted in Headlines, News and tagged Caribbean Masters, Carl Briskett, Clarendon, Duckworth-Lewis, Mark Audain, Melbourne OVal, Michael Holding Master, Tony Boyke. Bookmark the permalink.